I worked my trio of Jello mold pumpkins into a kitchen corner shelf vignette. The Jello mold pumpkins join a larger pumpkin, a vintage scale, orange thermos, coffee pot, tea pot, bread boards, Folger's puzzle, and faux fall flowers. A pumpkin pie recipe is in the flower frog. Crocks and vintage bowls on shelves below the vignette. I love decorating this little corner! 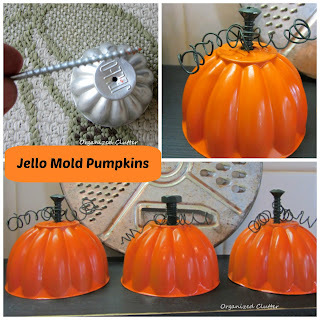 If you would like to make some Jello mold pumpkins, the tutorial is here. I must make me some of those precious little pumpkins! They are so cute. 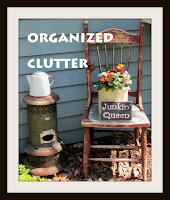 Your little corner looks very Fallish! Love your corner - everything looks so good and fallish. the jello molds are so cute. I need to get cracking and start decorating for fall. I've been busy getting things ready for fall at the booth, but have neglected home. Love the way you have displayed the Jello mold pumpkins. I have almost gotten over the shock of you putting holes in them. What is really impressive every time I see it in one of your post is that clever corner cabinet. What a great space! Your jello mold pumpkin are so cute!! Thinking I need to make some. Super cute Carlene! Love the little Jello mold pumpkins! Hi Carlene! Oh, I just love this vignette! Now those jello mold pumpkins are just too cute! You're the most creative one. I've never seen pumpkin jello molds before (gasp), so, obviously, I love yours! You've created a beautiful and festive vignette with them! Happy Fall!